So many Americans are very afraid of facing both known and unknown fears. They’re angry about certain socio-economic, cultural, religious, and political conditions, and often hateful towards those who offend them. The combined emotions of malignant fear, misdirected anger, and destructive hate threaten to undermine civil society, pitting various factions against one another and fostering ideological dissension. 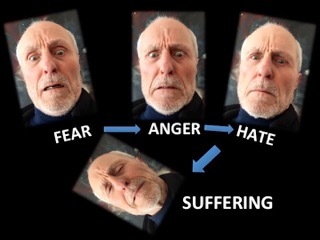 But, as the following frighteningly comical images illustrate, the primary outcome is suffering, for those who harbor negative emotions, as well as for those on the receiving end. This fear-hate-anger syndrome is particularly manifested in the US presidential race, with candidates resorting to rabid, oft-unfounded negative criticism of opposing candidates—even within their own parties. What’s even more distressing is the growing realization that approximately 20-30% of Americans hold extremely opinionated, emotionally expressed views about certain hot issues. When such opinions are founded on critical reasoning, factual information and good intentions, passionate support of a cause is understandably desirable. But, regrettably, many emotionally charged citizens who voice strong opinions in public media are largely uninformed, or simply misinformed, due in part to biased media reporting. I recently encountered the toxicity of social fear, hate, and anger when reading Shanghai Girls, a thought-provoking 2009 novel by Lisa See. Set in the late 1930s through the late 1950s, the story features two beautiful upper middle-class girls who come of age in pre-WWII China. They eventually escape to Los Angeles to join “paper-sons” in arranged marriages, and live there in a Chinese community throughout WWII and into the communist takeover of China by Mao Tse-tung (Zedong). The hardships the two sisters and their family endured as second-class citizens (in some cases undocumented) reminds the reader of America’s ongoing efforts to manage an influx of undocumented immigrants, especially those that might pose threats to national security. Two historical U.S. examples of racial-cultural mistreatment come to mind: the disproportionally unfair treatment of native-born American Japanese during WWII, and the mistreatment of Chinese Americans throughout the communist cold-war era, when many were suffering under ongoing FBI surveillance and interrogation. Moreover, both Japanese and Chinese Americans were ostracized by suspicious neighbors and received unfair, unequal hiring practices by government agencies and businesses. Does this type of behavior sound familiar in relation to more recent immigrants? Today, Tea Party Americans in particular are running scared—and very angry. Hence, the odd assortment of candidates professing extreme viewpoints about what kind of America is desired. The liberal, democratic-socialist viewpoint of Sanders resonates with Occupy-Coffee Party progressives, while the libertarian-capitalistic-religious views put forth by candidates like Trump and Cruz speak to Tea Party conservatives. In the meantime, undocumented immigrants living in the U.S, mostly represented by Latinos, and more recently Muslin arrivals, are caught in a situation familiar to that experienced by Americans of Japanese and Chinese descent during the 1940s-1950s. On NPR the other day a reporter interviewed some Iowans in a restaurant following the Republican Debate. Some voiced fears about terrorism and government control, especially concerning gun control (Don’t take away our guns!). So the main theme seemed to focus on wanting to feel safe and secure. I couldn’t help but wonder if these well-meaning folk understand how fortunate most Americans are to live in safe environments—especially in the hinterlands. What many people in developing countries struggle with just to stay alive day to day is so far beyond our privileged imagination. When I view TV and photos of what’s happening around the world with countless suffering people, I can only feel gratitude for living a good life in Minnesota. Yes, there are people living in dire circumstances nearby, perhaps some within blocks of where we live. But even they have it better than folks in war-torn, destitute countries. > Feasta: Putting Moral Philosophy Back Into Economics (Brian Davey). In my recently published book ( Credo: Economics in a World in Crisis) I show that it is possible to go back hundreds of years and trace the rise of quasi-religion economics as the world view of a business man with money to invest. But economics was originally considered to be a branch of moral philosophy, with representatives like Adam Smith and Rev. Thomas Malthus. The ideas underpinning mainstream micro-economics are those of a moral philosophy called utilitarianism, as worked out by Jeremy Bentham and later adapted by other thinkers. Today if you read most textbooks about “Positive Economics” you learn that it is not the job of economists to describe the world as it should be but rather to describe it as it is. A distinction is made between facts and values taken from philosopher David Hume. It looks as if all the moral philosophy has been taken out of the subject of economics. > Econ Browser: Can Lower Oil Prices Cause A Recession? (James Hamilton). Donald Luskin writes in the Wall Street Journal: “The global economy is slipping into recession. The evidence is showing up in all the usual ways: slowing output growth, slumping purchasing-manager indexes, widening credit spreads, declining corporate earnings, falling inflation expectations, receding capital investment and rising inventories. But this is a most unusual recession– the first one ever caused by falling oil prices.” A drop in oil prices means less money in the hands of oil producers but more money in the hands of oil consumers. Currently the U.S. is importing about 5.1 million barrels a day more than we’re exporting of crude oil and petroleum products. At $100 a barrel, that had been a net drain on the U.S. economy of $190 billion each year. That drain that will now be cut more than half by falling oil prices. > NPR: Why Cheap Gas Might Not Be Good For The U.S. Economy (Chris Arnold). Vipin Arora, an economist with the U.S. Energy Information Administration suggests that cheap gas might be bad for America, as based on his own research. “The benefits to consumers could be around $140 billion from gasoline savings,” Arora says. “But the losses on the other side due to lower production, less investment, less build-out of infrastructure could be around that amount. So we’re kind of at a wash.” Jim Bianco, president of Bianco Research in Chicago, says a slowdown in China and elsewhere around the world is driving down the price of oil along with other commodities such as copper, aluminum and zinc. It’s part of a larger global slowdown that will hurt the U.S., too. > CNN Money: U.S. Recession Cries Get Louder (Heather Long). The chance of the U.S. sinking into a full-blown recession now stand at 18%, according to a CNNMoney survey of economists this week. That’s nearly double what the nation’s top economic policymaker predicted only a month ago. “The manufacturing sector is already in recession,” says Brett Ryan, chief economist at Deutsche Bank. Ryan and many economists told CNN Money they are watching claims for unemployment benefits closely as an indicator that the strain is moving beyond manufacturing and into other parts of the economy. > Ellen Brown: The Populist Revolution: Bernie And Beyond (Ellen Brown). The world is undergoing a populist revival that involves economic policies. For decades, private sector banking has been left to its own devices. The private-only banking model has been thoroughly tested, and it has proven to be a disastrous failure. We need a banking system that truly serves the needs of the people, and that objective can best be achieved with banks that are owned and operated by and for the people. “Nationalizing” the banks implies top-down federal control, but this need not be the result. We could have a system of publicly owned banks that were locally controlled, operating independently to serve the needs of their own communities. See also: Santa Fe Moves A Step Closer Towards Creating A City-Owned Public Bank. > The Guardian: The Zika Virus Foreshadows Our Dystopian Climate Future (Bill McKibben). Spread by mosquitoes whose range inexorably expands as the climate warms, Zika causes mild flu-like symptoms. But pregnant women bitten by the wrong mosquito are liable to give birth to babies with shrunken heads. Brazil last year recorded 4,000 cases of this “microcephaly”. As of today, authorities in Brazil, Colombia, Jamaica, El Salvador and Venezuela were urging women to avoid getting pregnant. A civilization where one can’t safely have a baby is barely a civilization. But even more obviously we need to face up to the fact that pushing the limits of the planet’s ecology has become dangerous in novel ways. > On Earth: Watch 135 Years Of Global Warming In Under 30 Seconds (Clara Chaisson). With the end of 2015, the planet closed out its hottest year on record, smashing the previous high set just the year before. That’s right, two hottest years in a row! This NASA visualization shows our journey to these steamy times, starting way back in 1880 when we first began keeping tabs on global temperatures. 15 of the 16 warmest years on record have occurred since 2001. > Independent: Global Warming: Data Centres To Consume Three Times As Much Energy In Next Decade, Experts Warn (Tom Bawden). The amount of energy consumed by the world’s data centres will increasingly place an enormous strain on energy supplies and deal a hefty blow to efforts to contain global warming. One way to curb their carbon footprint is to increase the amount of renewable energy they use – a development that is already under way but has much further to go to offset the exponential growth in internet traffic. More responsibility for the types of information conveyed via Internet is also needed, especially regarding social media, which accounts for a growing portion of Internet traffic. > Bloomberg: America’s Using The Least Coal Ever To Keep The Lights On (Mario Parker). The U.S. is using the least amount of coal ever to make electricity as cheap natural gas establishes itself as the nation’s favorite power-plant fuel. Coal’s share of total electricity generation fell in November to a record 29 percent. Natural gas was the dominant fuel for a fifth straight month, making up 34 percent of the U.S. power mix, the Energy Information Administration said in a report Tuesday. The record low demand underscores how dramatic the collapse of the U.S. coal market has been as low natural gas prices and mounting environmental regulations weaken demand for what was once the source of more than half the nation’s power. > Forbes: U.S. Wind Industry Posts Huge Gains For Q4 2015 (Peter Kelly-Detwiler). According to the American Wind Energy Association AWEA), which just released its fourth quarter report, the U.S. wind industry had its second best quarter ever, with 5,001 megawatts (MW) of installed capacity. This brings the 2015 annual total to 8,598 MW and the cumulative installed total to 74,472 MW (with over 52,000 operating turbines). More than 4,300 turbines were installed in 2015, in 37 projects across 17 states. Put another way, that represented just under twelve turbines coming on line every day. > Rocky Mountain Institute: How Energy Efficiency Enables Stable Capital Markets (Martha Campbell). A paradox currently exists in the U.S. home improvement market. While homeowners say they want energy improvements for their homes, the rate of home energy upgrades is decreasing. One study found that residential energy upgrades are the top unmet demand among U.S. households. So why aren’t more homeowners investing in energy upgrades? RMI found—after the course of hundreds of interviews with industry experts—that a combination of inconvenience and poor access to upfront capital for home energy improvements is to blame. One of the best ways to spur investment in energy-efficiency upgrades is through the availability of energy-efficiency financing programs such as property-assessed clean-energy (PACE) financing. > CNN: Zika Virus ‘Spreading Explosively,’ WHO Leader Says (Greg Botelho). The Zika virus is “is now spreading explosively” in the Americas, the head of the World Health Organization said Thursday, with another official estimating between 3 million to 4 million infections in the region over a 12-month period. A major concern is The children of Zika: Babies born with disorder linked to virus. The regularly occurring global weather phenomenon known as El Niño is expected to make things worse by increasing mosquito populations. > National Geographic: Water Risks Are Growing; Here’s A Tool To Help Us Prepare (Sandra Postel). Earlier this month, the World Economic Forum in Davos, Switzerland, released its annual risk assessment, which looks across the spectrum of threats to society and ranks them. This year, it declared water crises to be the top global risk to society over the next decade. Just behind water crises were the failure to adapt to climate change, extreme weather events, food crises and profound social instability. Together, these five threats constitute an interwoven risk landscape that has water shortages, in one way or another, at its core. The study characterizes 71% of world-irrigated area and 47% of large cities as experiencing at least periodic water shortage. See also MPR: Could The Flint Water Crisis Happen Here? > Yahoo News: Child Obesity An ‘Exploding Nightmare’ In Developing World (AFP). Childhood obesity has reached alarming rates globally and become an “exploding nightmare” in the developing world, including Africa where the number of obese and overweight children under five has nearly doubled since 1990. Biological factors, inadequate access to healthy foods, a decline in physical activity in schools and the unregulated marketing of fattening foods are among the drivers of a worsening epidemic that requires a coordinated global response, the report said. If not reversed, “the obesity epidemic has the potential to negate many of the health benefits that have contributed to the increased longevity observed in the world,” added the report, commissioned by the UN’s World Health Organization (WHO). > Yale360: How ‘Natural Geoengineering’ Can Help Slow Global Warming (Oswald J. Schmitz). An overlooked tool in fighting climate change is enhancing biodiversity to maximize the ability of ecosystems to store carbon. Key to that strategy is preserving top predators to control populations of herbivores, whose grazing reduces the amount of CO2 that ecosystems absorb. Recent studies have shown that the loss of important predators — from wolves in boreal forests to sharks in seagrass meadows — can lead to growing populations of terrestrial and marine herbivores, whose widespread grazing reduces the ability of ecosystems to absorb carbon. Still, the impact of biodiversity loss on the climate system is underappreciated. > MN Daily: U Offers Climate Change Courses (Eliana Schreiber). A new course, Climate Change — Myths, Mysteries and Uncertainties, will teach students to understand the basic science behind climate change and will explore ways to address issues surrounding the phenomenon. The course is part of the Grand Challenges Curriculum, an effort by the University to tackle problems with an interdisciplinary approach, said Jennifer Powers, professor of ecology, evolution and behavior and plant biology in the University’s College of Biological Sciences. > Green Fire Times: Creating Local Community Resilience To Avoid Climate Catastrophe (Robert M. Christie). To say that local economies must increasingly rely on local production and consumption to be sustainable has almost become a cliché among many environmentalists. Clichés are often overstated truths not necessarily acted upon. As the converging global crises of climate, economy and energy intensify, national and global economies grow increasingly less stable. These instabilities will directly affect local communities. To face this reality, we must build largely independent, resilient communities and regions. That must extend to mitigating the destructive effects of profligate extraction-production-consumption-waste. > Resilience: Taking The Pulse Of A New Food Trend (Wayne Roberts). The post-World War 11 enshrining of meat over former staples such as beans and grains has proven to be a mistake for public health and the environment. Today’s bad memories will be of lives and pleasures cut short by too few, not too many, seeds and grains. This year, the United Nations calls for a global celebration of pulses. Beans are no longer has-beans. Here’s a brief article explaining some of the details that make a hill of bean’s worth of difference. > Shareable: Microgrids Paving The Way For Distributed Energy (Bezdomny). The energy market in the US is getting more diversified as consumers shift their habits by producing more electricity autonomously while increasing environmental regulation is impacting the main grid. Many people producing their own renewable power can form their own community grids. Smart Grids and Microgrids that use technology to economize consumption are starting to change the way many people think about energy, while also providing for a more symbiotic relationship with centralized national grids, which may have a tougher time competing with the now flourishing decentralized energy production sector. Microgrids are also creating a whole new market for energy where people can buy directly from their neighbors, and at a discount. > Shareable: John Thackara On How To Thrive In The New Economy (Interview, Darren Sharpe). The book is about the proposition that taken together, the myriad and still growing swarm of small projects around the world in which people find new ways to meet their daily needs, that the total of these is greater than the sum of the parts. That is to say something big is happening which isn’t per say visible, it’s a coherent single story, but that in 1001 different contexts and situations people are not waiting for a big idea or even a label for a movement to do stuff, they’re doing things to meet needs on a daily basis. I tell some stories about people meeting the need for food, or moving around, or clothing themselves, in different ways which either explicitly or implicitly include the notion of doing less harm to the planet and in the most significant cases leaving the planet a healthier place. > The Archdruid Report: Retrotopia: Lines Of Separation (John Michael Greer). This is the fourteenth installment of an exploration of some of the possible futures discussed on this blog, using the toolkit of narrative fiction. Our narrator [Peter Carr] returns from his trip to a tier one county full of doubts about the Lakeland Republic’s prospects, and has those at once challenged and sharpened by a conversation at the local Atheist Assembly, where he learned that, because of a strong belief in separation of church and state [churches tend to meddle in state affairs], religious groups are not exempted from paying taxes. > Citizens for Sustainability: Meeting-Forum, Sat., Feb. 13, 10am-noon, Silver Lake Village Community Center, 3301 Silver Lake Rd. > MN350, Xcel, ISAIAH, & 500 People of Faith: The Whole Creation: A Faith Summit On The Environment And The Economy, Sun., Feb. 21st, St. Mary of the Lake Catholic Church, 4741 Bald Eagle Ave., White Bear Lake, MN.